The prawns and shrimps are an incredibly diverse group with around 2500 species known from around the world, and about 750 in Australia. 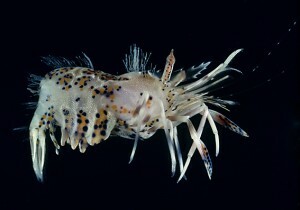 While they are primarily marine they can be found in a variety of environments ranging intertidal pools to hydrothermal vents in abyssal depths; however they also are common in estuaries and freshwater. They are both free-swimming and bottom dwelling in habit, and sometimes commensal. An ancient group, their fossil record dates from the mid-Jurassic, around 180 million years ago. Often the common names "prawn" and “shrimp” are used interchangeably. While there is no universally accepted difference amongst the general public, they represent two major biological divisons based on the types of gills, and how many legs end in claws. If only the first two pairs of legs have claws they are called caridean shrimps. If the first three all end in claws then they belong to the dendrobranchiate prawns, and it is this group that forms the basis of the most important commercial fisheries. Banana Prawn (Penaeus merguiensis) Spiny Tiger Shrimp (Phyllognathia ceratophthalma): Great Barrier Reef south to Moreton Bay; also Indo-West Pacific.